N’Golo Kante has revealed that Lionel Messi is the best player that he’s ever come up against, an answer that shouldn’t really be surprising to anyone who’s watched the Argentine play before. Kante revealed this information to a fan, as the French midfielder watched Match of the Day with a fan on Saturday, as seen in the tweet below. 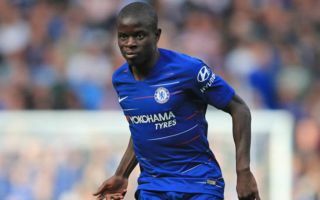 Having come up against players like Paul Pogba, Philippe Coutinho, Kevin De Bruyne and Antoine Griezmann in his Chelsea career, Kante certainly wasn’t spoiled for choice when he revealed this information. However, the 27-year-old revealed that five-time Ballon D’Or winner Messi was in fact the best player he’s ever had the misfortune to play against. He said LM10 was the best player he has played against and zizou is the best player he has played with. It’s not really shocking to anyone to hear Kante say this, as Messi is undoubtedly one of, if not the, best player to ever grace a football pitch. The Argentine has continued to be one of the best players on the planet for around a decade now, and his ability can’t really be matched by any other player in the sport. Kante came up against the forward during the World Cup this summer, as well as when Chelsea faced Barcelona in the Champions League last year, a tie the Blues ended up losing 4-1 on aggregate. Above all, it’s nice to see a player who has recently been crowned a world champions in Kante be so humble, and be willing to give up his time to spend it with someone who seems to be a fan of his.